As many bikers would pose, a muddy ride means a happy rider. This is particularly true among mountain bike enthusiasts who enjoy the off-road and rough trails that the country offers. When visiting a new highland train, it is impossible to prevent mud and dirt from sticking to your bike. This is even more so during ‘soggy’ months – a period when the road is just muddier due to the weather. For some, all of the accumulated filth can be worn as a badge of honor. That you conquered a trail. And it is very true, at some point. But there are times when you also need to appreciate the art of cleaning and maintaining your bike. It is not the most exciting activity to do, we all agree to that. But cleaning the ride is an integral job to keep your ride in shape. 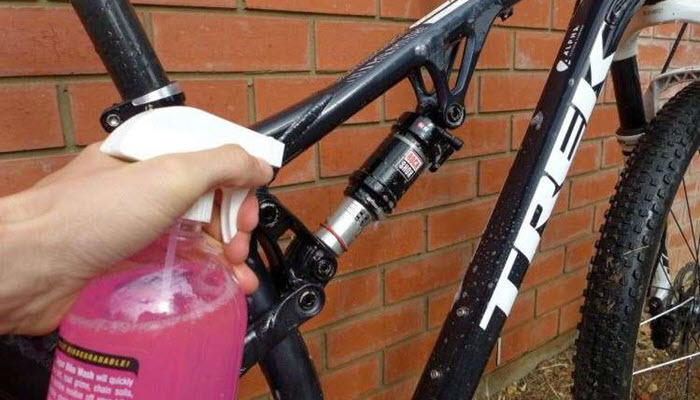 For such reason, every mountain bike owner should have a technical know-how when it comes to cleaning. If not, we can help you with that! In the past, we published an article that talks about the method of cleaning the chain of your bike (mainly focused on the best time to clean/maintain your bike chain, and the products that you can use when cleaning). 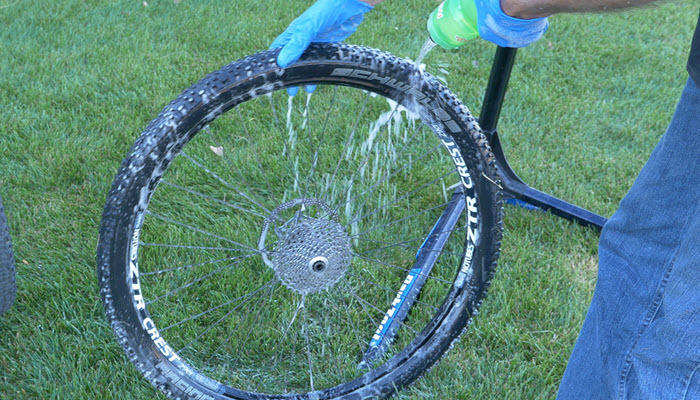 As a complementary piece, this article offers a holistic approach when it comes to bicycle cleaning and maintenance. Why do you need to clean your ride? Machines break over time. What we can do is to keep them clean and well-oiled to function as long as possible. The same principle applies to bicycles. More than a visual treat, a clean ride also means a better performing machine. That is why it is sad that some owners would skip buying cleaners and lubes in order to “save extra money”. But the truth is, these are essential investments to keep your ride running. A well-maintained bike means lesser problems in the future. Always remember that dirt and moisture will eventually result in frame corrosion, faulty drivetrain, and rusted components. Replacing those items is, without a doubt, more expensive than buying a spray-on cleaner. You don’t need to be a mechanical engineer to understand this trade-off. And luckily, you don’t need to be a mechanical engineer to clean your bike! A power hose and/or a bucket. A big-size brush and a small-size brush. A sponge and a cloth. Bike lube and bike polish. A bike stand (if available). 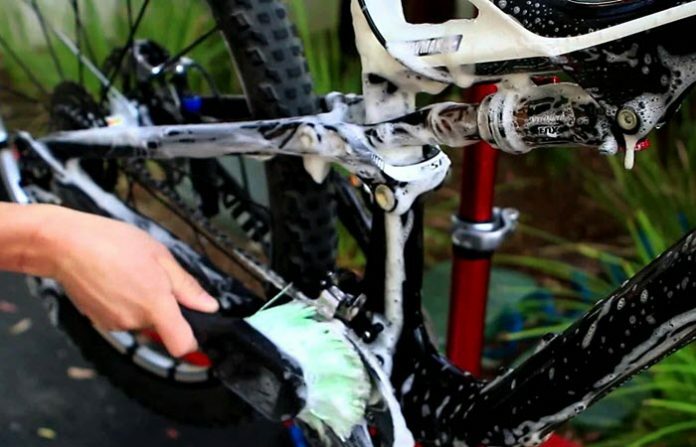 If this is your first time cleaning your bike, this eight-step walkthrough will surely be helpful. Read on. Find a spacious area where you can clean your bike without much distraction. Make sure that the area is vacant for an hour or two in order to complete the process the soonest. If you’ll be using a bike stand, you should set it up before you start cleaning your ride. 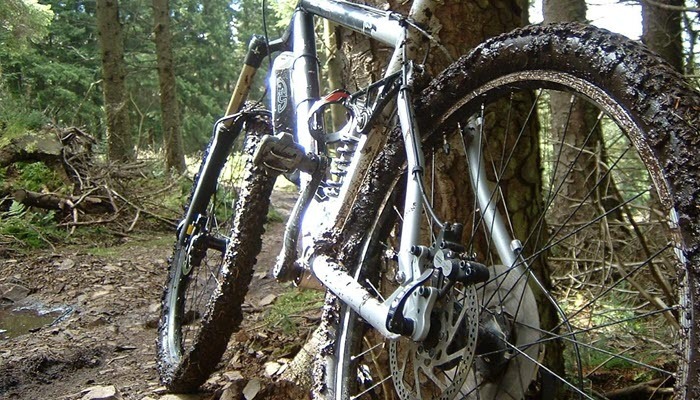 With your hose/bucket, you can start the process by thoroughly washing your mountain bike. Remove all the excess and visible dirt/mud using plain water. No matter how thick the dirt is, water will do the heavy lifting. If you are using a power hose, it would be easier to remove all of the dirt. But always be sure that you are in control of the pressure and you are not standing too close. Otherwise, you might end up damaging the smaller components of your bike. If you are the old school type, a bucket of water and a sponge will still do the work. Not to mention that you will still need to use these two when you start cleaning the drivetrain. During the first wash, focus on the larger parts or the bike like the frame, wheels, and tires. Before you leave it to dry, evenly spray-on the bike cleaner on the frame and fork. Just make sure that your spray-on is away from the disc brakes to avoid an unnecessary issue. While a big brush is good for cleaning bike frames (for speed and efficiency), a finer brush is more useful when cleaning smaller bike parts (they work like magic when cleaning the chain). As such, you’ll need different sizes when cleaning. Always be thorough when brushing the drivetrain – this set includes the cassettes, chain, chainring, cranks, derailleur, and pedals. This is usually the greasiest/dirtiest part of your bike. At the same time, this part also needs the most desperate attention because this gets your ride moving. As believed, this is the very heart and the very weakness of your mountain bike. Better take care of it. Bike cleaners are quite helpful when removing the grease from your chain and cassettes. 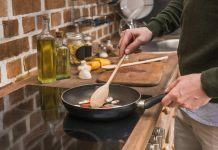 The chemical easily cuts through the oil and grease that accumulated for weeks or even months. You really don’t need need to soak all parts with cleaner. Just select the filthy parts that need extra pounding. When cleaning the drivetrain, always make sure that both side of the chainring and cassettes are well-polished. Work on your disc brake. 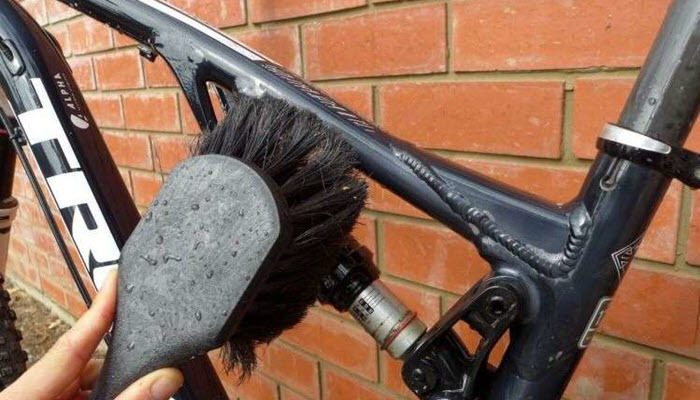 As mentioned earlier, disc brakes are pretty sensitive to cleaners. Do not experiment if you are not ready to buy extra bike parts this weekend. The good thing is that this part is very easy to clean and maintain. In fact, you’ll only need water and damp cloth to clean your disk brake. If you happen to have a disc brake cleaner spray, then that would be great. Just hose it and give it a good wipe and it’s A-Okay! After brushing and applying some cleaner, you then need to meticulously rinse all of the parts. 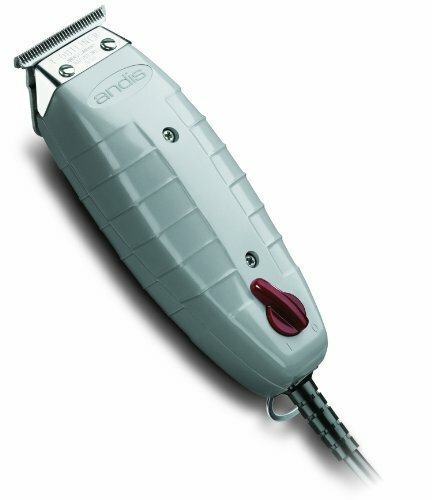 This ensures the removal of excess chemicals. You then need to dry it post-wash. This removes the extra moisture that may cause rust in the coming days. You can use a dry cloth to speed-up the process. When drying, keep close attention to your drivetrain and suspensions. They are pretty “sensitive” compared to other parts. Many consider this as the most rewarding portion. After the monotonous cycle of brushing, and wiping, and rinsing, this step signals the near-end of the cleaning phase. You can start by placing a small amount of bike lubricant at the lining of your suspensions (both front and rear shock absorbers). Then, pump the bike a couple of times to pressure the suspension. You will likely notice a bit of grit due to excess lube. Just wipe it all clean. You don’t want too much grease on your bike because it will only attract dirt the next time you take a road trip. Afterwards, oil and lube the drivetrain parts. This part is easy and oddly satisfying. First, continuously run the chain as you apply the oil and lube. When they are evenly distributed, get a dry clean cloth and run the chain through it by pedaling. Again, this is to remove the excess grease. After putting lube to the suspension and drivetrain, finish the task by putting a little bit of oil to other components like the joints of your crank and handlebar, and derailleur pivot. This is a must to avoid rusting. If you still have some time and energy left, you can always spray some bike polish just to give your bike the extra flash. Other than cleaning, you also need to do regular maintenance check to keep your ride at its best performance (especially when it comes to safety). The points listed below are the essentials. Even without riding your bicycle, your tire pressure will eventually drop-off. Experienced cyclists will easily recognize the loss of psi due to the more sluggish riding performance. 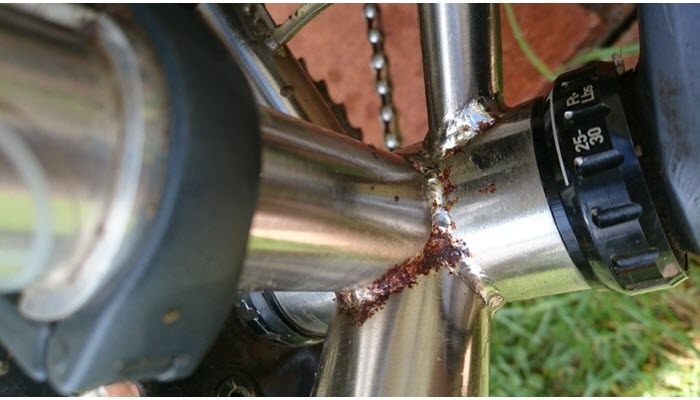 Flat tires can also damage the rims of your bike. That is an expensive thing to replace. You can avoid this by investing in a digital tire pressure gauge. 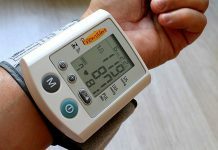 In this way, you can constantly check the pressure level. Check the brakes of your bike regularly. Brakes should always be tight and responsive. You can check by yourself if the brakes are tight enough. As a rule, the brake lever should maintain a finger width from the handle when pulled. If the brake levers touch the handles when pulled, they seriously need some adjustment. Habitually check the condition of your bolts and bearings. Though you really don’t need to do every single time you go for a ride, this is still a must. Tightening the bolts and bearings will eliminate the creaking sound and the loose control of your mountain bike. At the end of the day, a clean ride means a happy rider! If you want to learn more about the mechanics of a bicycle, you can start by reading our article on how to build a road bike. You can also check our choices on the best and the hottest hybrid bike and cruiser bike available on the market today. Enjoy!